In previous two posts, we learned basics of pointers. We learned to create pointers and how to perform arithmetic operations on them. We learned to create pointers to int and char. In real, you can have pointer to any type in C. You can have a pointer to int, char, float, double, structure, array or even pointer. In fact, you can declare pointer to pointer to pointer to pointer. That looks complex. For now, let us focus on pointer to pointer. If a pointer points to a pointer of same type, we call it as pointer to a pointer. Read the statement slowly again, if you did not catch my words. 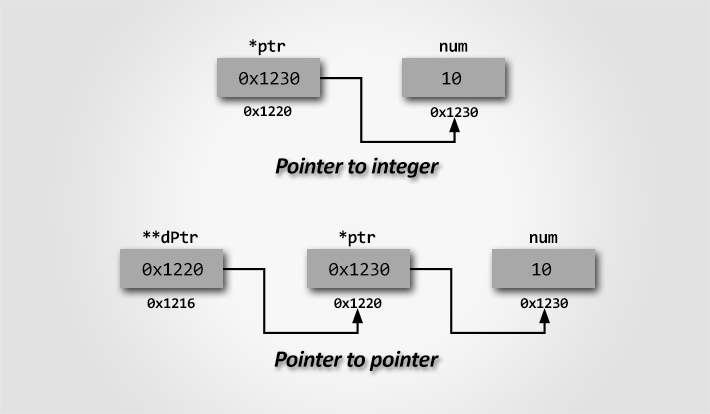 Many texts and authors also refer pointer to pointer as double pointer, since two pointers are involved. In the above image pointer *ptr points at memory location 0x1230 of integer type. Pointer **dPtr points at memory location 0x1220 of integer pointer type. Note: Pointer to pointer will always store address of a pointer of same type. Pointer to a pointer declaration follows same declaration syntax as normal pointer declaration. The only thing you must care is it contains two * asterisks. In general increase number of * asterisks during pointer declaration to increase pointer level. Here double ** specifies it as pointer to pointer (double pointer). Increase number of * asterisk with increase in pointing levels. Means for pointer to pointer to pointer use ***. The above statement declares a pointer to integer pointer type. Like declaration, pointer to pointer initialization is also similar to simple pointer initialization. However, you must be cautious while initializing pointer to pointer. As it, accept address of a pointer variable of same type. We use dereference * operator, to access value stored at memory location pointed by a pointer. However, single dereference will not work when dealing with pointer to a pointer. In order to access value pointed by pointer to a pointer we use double dereference ** (indirection) operator. Write a C program to demonstrate the use of pointer to a pointer.